With the iPhone 5 release date just one month away, new details and new photos have emerged about one of the most significant iPhone 5 features – the Mini Dock. The first rumors about a redesigned dock on the iPhone 5 began in February, with iMore claiming that Apple would be introducing a completely new, smaller dock – and not just for the iPhone – but on all iOS devices. Various claims have been made about the number of pins the iPhone 5 dock would contain – with suggestions of 19 pins coming in from TechCrunch and Reuters in July, and more recently iLounge reported on an 8 pin connector. While the number of pins does actually influence the amount and type of data that can be transferred, it’s safe to assume that Apple engineers will choose the minimum necessary number. What is interesting about the new iPhone 5 mini dock is that the images released by French site Nowhereelse.fr appear to show a smooth metallic ring inside the dock, similar to the MagSafe connector on Apple’s MacBook range. A MagSafe style dock connector for the iPhone 5 could allow for reversible insertion of the cable, as well as easier connection and disconnection. Besides the iPhone 5 dock, the latest batch of photos to appear also give hints at one of the other important iPhone 5 features – the display size. 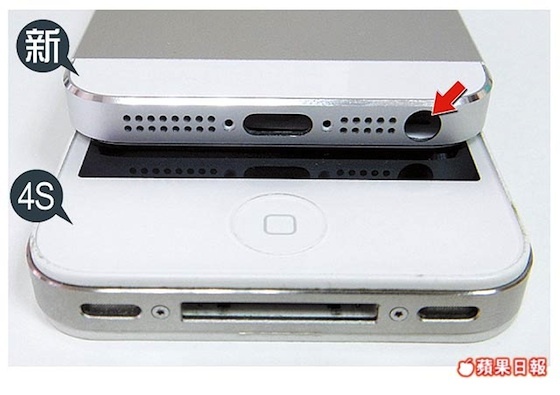 In the end-on view of the alleged new iPhone, you can clearly see that the iPhone 5 is wider than the iPhone 4S. This runs contrary to claims that only changes had only been made in the vertical height of the device to accommodate the new 4-inch screen. The reported dimensions of the new iPhone are: 58.47 mm wide, 123.83 mm tall and 7.6 mm thick. The current iPhone 4S is 9.3 mm, so while the iPhone 5 will be both wider and longer – it will also be 18% thinner. The iPhone 5 release date is reportedly scheduled in for a press event on September 12, where Apple is also expected to announce the iPad Mini. Take a look at our complete iPhone 5 rumor roundup for full details on what iPhone 5 features to expect next month. What do you think of the new mini dock? What other iPhone 5 features are you hoping to see on launch day? Share your thoughts in the comments below.